So what do we have here? Yep, another foundation to add to my ever growing collection. I have recently become a foundation fanatic, some people could say it has become a little bit of a problem - every time I step into Boots or Superdrug I have to have a look at the foundations, it doesn't matter what brand it is by, if it looks and sounds like it will work for me then I have to grab it, well as long as I haven't tried it before that is. I am always on the look out for perfect every day foundations as I sometimes get stuck in a rut and end up using the same foundation over and over again and I then get bored of it haha! I was browsing the E.L.F site the other week and I had heard some good reviews on this foundation so I thought I would pick one up and give it a chance. Oh and by the way, trying to pick your shade online is not the best idea and ended up being pretty hard for me, however, luckily I didn't do too bad! So, lets get straight into the review. When my package finally came in the post I was so excited, but slighty nervous too as I didn't know if the shade I had ordered was going to match my skin tone, then as soon as I spotted the foundation and picked it out and swatched it I was feeling quite pleased with myself. E.L.F state that you will be able to achieve a flawless complextion with the skily smooth E.L.F Studio Flawless Finish Foundation. The lightweight and oil-free formula blends in naturally for a beautiful semi-matte finish. This liquid applies easily and lasts all day for visibly brigher and radiant looking skin. Using the Flawless Finish Foundation not only restores uneven skin textures and tones, but most importantly, the SPF 15 protects your skin against harmful sun damage!. I love trying out new foundations, like I mentioned above, so after trying this out for a few days and in many ways I thought I would do a full in depth review on this. 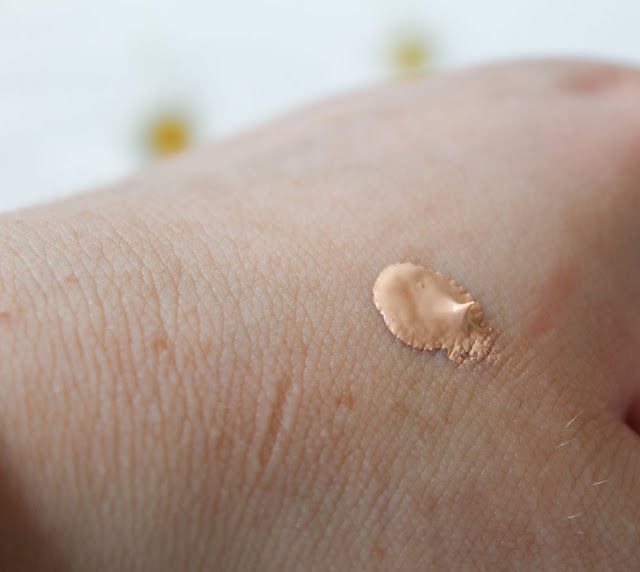 To be honest, I was a little skeptical about trying this out after I swatched it because I did notice that while it was on the back of my hand it oxidized a little bit. However, this foundation was such a surprise! 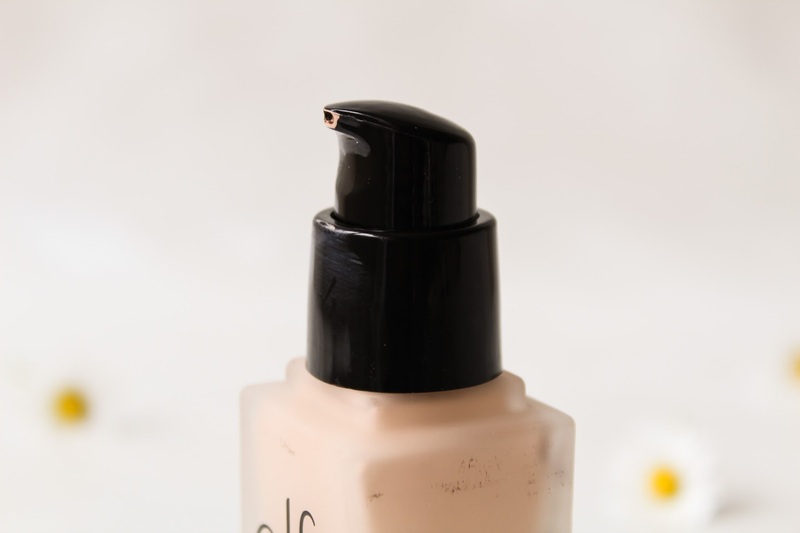 This foundation comes in a frosted glass bottle that feels very high end and luxurious and also quite heavy. I was quite surprised at how heavy and high quality the packaging was considering how cheap the foundation actually is. This foundation also comes with a pump and I love foundations that come with a pump because they are more sanitary, easier to dispense the product and you can also control the amount of foundation you are going to get out, plus, you don't have to worry about the foundation dripping on to the side of the bottle which can get a little gross after a while! Basically, every foundation should just come with a pump and everyone would be completely happy haha! The formula of the E.L.F Flawless Finish Foundation is oil-free and it also has an SPF of 15. 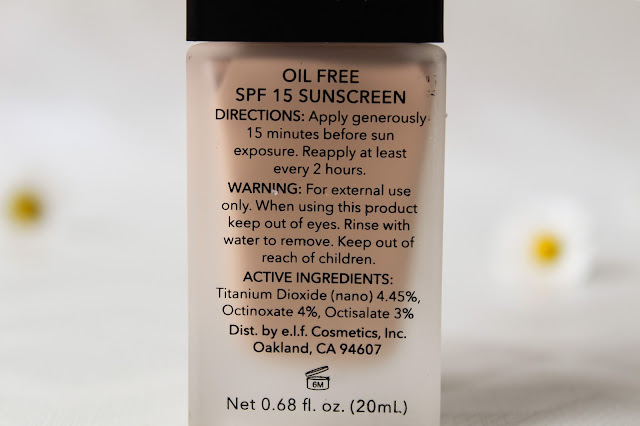 It is written on the back of the bottle that this foundation is supposed to help prevent sunburn, and I did giggle a little at the part where it says to ''reapply at least every 2 hours''. The texture is not too thick and not too thin, when I pump it onto the back of my hand it only runs a little bit. This foundation is silky smooth and the finish is a semi-matte finish but I still go ahead and set it with a powder as laways. To apply this foundation I just take a couple of pumps onto the back of my hand and then take a beauty blender and buff it into my skin. I found that I liked a beauty blender best to apply this compared to a brush as the beauty blender gave me more coverage and a much more even finish. I woud say that this is a medium to full coverage foundation and you can layer this without it looking or feeling cakey at all which is a plus! The coverage is beautiful, a lot better than I was expecting to be honest. This foundation was able to cover my redness and any blemishes that I had on my face at the time, and I found that I didn't need to use as much concealer. The shade that I picked up is called Alabaster and considering that I ordered this online and had absolutely no idea what shade I would be, I think I did a really good job and managed to get the right shade. Here in the UK, E.L.F is now sold in Superdrug, however, they only stock 6 shades compared to the E.L.F website which has 10! That may not sound like a big difference but for people who have really fair and really dark skin this can be a problem. For example, Superdrug do not stock the shade Alabaster, which is the shade I am, so I would end up having to get a shade lighter or darker (slightly annoying). Alabaster is probably the third lightest shade that has a very neutral undertone to it, so it is not too yellow or too pink which suits me really well. I did notice that this oxidized just a tiny bit but once I put concealer and powder on it looked perfectly okay. This foundation retails in Superdrug and on the E.L.F website for £7.50 and you get 0.8oz which isn't actually that much, it's less than what you would get in your standard 30ml foundations, so for the price you don't get a lot. As for the foundation's longevity, yes, it stays on all day! You don't need a lot of this foundation either, I used around 2 full pumps to get a full coverage on my whole face which was surprising as I thought I might have had to go back in with at least 1 more pump. 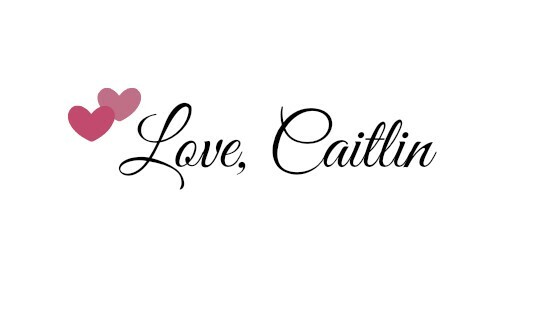 The foundation doesn't fade too quickly and whenever I wear this, I don't feel the need to touch up. However, I did wear this recently when it was really hot here in the UK and I did notice that it broke up around my nose, chin and on my forehead but that was probably due to the hot weather. You can also add a little powder during the day if you are quite oily and viola, back to having gorgeous foundation. 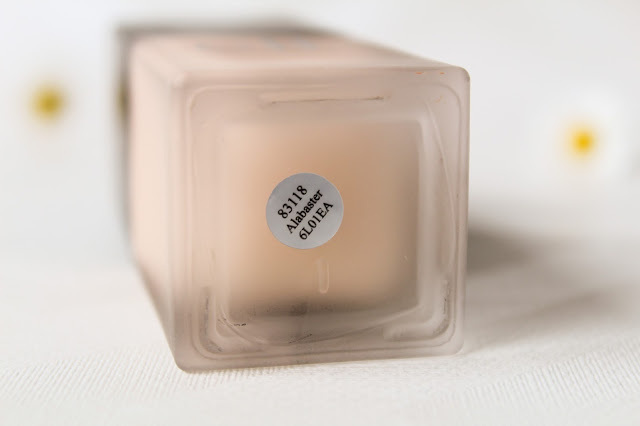 Overall, I think that this is a really good and impressive drugstore foundation. It has beautiful coverage and a lovely finish that isn't too dewy or too matte. It lasts throughout the day and doesn't need touching up. 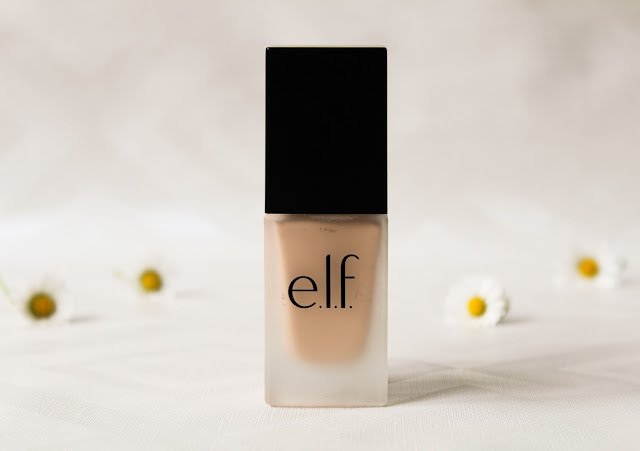 I think that E.L.F did a really good job with this foundation and I would highly recommend it to my friends and family for an everyday foundation. For just £7.50 you can't go wrong really, however, I do wish you would get a little more product in the bottle. If you want you can pick this foundation up from Superdrug or E.L.F's website. Have you tried this foundation? What are your thoughts on it? Let me know in the comments! I love elf and i always like to try their foundations! Such a nice packaging ! It looks similar to the Nars packaging. I was really surprised with this foundation and how good it is! It does doesn't it? !